Each golf fan will have their own personal criteria for what they watch on TV from week to week. They certainly have enough options, with the PGA Tour practically going non-stop, supplemented by the LPGA, European Tour, Web.com Tour and PGA Champions. Almost everyone tunes in for the four Majors but beyond that, choices vary widely. It might come down to last minute decisions based on news about a favourite player in contention or a long-standing commitment to watch certain events because of the course or the format. Apart from Patrick Reed declaring himself a Top 5 player in the world a few years back, Captain America had only occasionally flirted with the kind of brilliance that dominates seasons and wins majors. Last April, he fashioned a Saturday 14-under lead at Augusta, then hung on Sunday to nab the green jacket. Rickie Fowler put on a great show to finish second and a hard-charging Jordan Spieth looked like he might catch Reed and force a playoff but a bogey on 18, derailed his chances. World #1 Dustin Johnson started the final round tied for the lead with Whee Kim, Byeong Hun An and Kevin Tway. Playing what was likely the last Canadian Open at Glen Abbey, DJ pulled away from the pack with a brilliant 66 to win by three. As you may recall, 47-year old Phil Mickelson was struggling mightily early in the season with both his driver and putter, so when he arrived in Mexico City, he didn’t have any great aspirations for winning – he was just trying to get his game in better shape for the Masters. The back nine on Sunday featured a trio of youngsters chasing the veteran: Justin Thomas, England’s volcanic Tyrell Hatton and Spain’s Rafa Cabrera Bello. The Europeans gave it a valiant effort but couldn’t catch Mickelson. Thomas seemingly knocked himself out of contention too with a bogey on 17 but then he jarred his approach on 18 for an eagle to tie Lefty. But Phil was not about to let this one get away - a birdie on the first playoff hole was all he needed to claim the WGC title. Tiger Woods began his 2018 season shrouded in mystery. Nobody, including himself, knew whether his surgically repaired back could stand up to the grind of four competitive rounds of golf, let alone a full season. And he’d barely played more than a handful of events in three years so nobody was really sure what kind of game shape he was in either. He finished T23 at the Farmers Insurance Open in January but then a lacklustre missed cut at Riviera had everyone wondering which was the real Tiger. However, Riviera seemed to motivate Tiger. He added the Valspar to his schedule, a tournament he’d never played before and quickly dispelled any doubts as to his competitiveness. Tiger jumped into the lead on Friday and started in the second last pairing on Sunday, still just one shot out of the lead, held by Canadian rookie Corey Conners. Playing more than an hour in front of the leaders, Paul Casey reeled off a brilliant 65 to hold the clubhouse lead. Tiger started his final round with a birdie but couldn’t do anything more than reel off a bunch of pars until he got to the 17th. Then a miraculous 45-foot birdie putt left him just one back with one to play. Could he make another birdie and force a playoff? Not quite. But Tigermania was back like never before. The golf world had been collectively scratching its head for over a year wondering what was the matter with Rory McIlroy. Largely invisible in majors and with no wins since the 2016 Tour Championship, the Northern Irishman was an enigma when he arrived at Bay Hill in Orlando. Normally, one of the attention grabbers every time he tees it up, this week, all attention was on Tiger Woods, who had finished T2 the week before at Valspar. Tiger owns Bay Hill, at least in the competitive sense, with eight victories in the Arnold Palmer Invitational. But nothing fires up McIlroy more than a chance to prove himself against Tiger, so even before either player hit his first shot, the battle was on. Sunday’s final round featured a cadre of players fighting for the lead including McIlroy, Henrik Stenson and Bryson DeChambeau. Woods started five shots back but by the middle of the back nine, with 110% of the crowd cheering him on, he was just one shot off the lead. Then he blew his tee shot on #16 out of bounds and that was it for Tigermania 2.0. Meanwhile, McIlroy decided enough fooling around. He reeled off birdies on 13, 14, 15 and 16 and slammed in a 25-footer on 18 to close with a three-shot win. The Kid was back! Only six players have ever won back-to-back U.S. Opens in history and nobody had accomplished the feat since Curtis Strange in 1988 and 1989. Reigning Open champion Brooks Koepka had won the 2017 title on a very wide open, soft course at Erin Hills with a bomb-and-gouge strategy that sets up well for most regular PGA Tour events but doesn’t usually play well in national championships. Especially at Shinnecock Hills, the site of some treacherous greens and unduly severe conditions. Koepka wasn’t exactly a favourite either, as his previous win was considered something of a fluke. Sure, he could hit the ball a mile, but could he handle Shinnecock’s greens and gnarly rough? World #1 Dustin Johnson threw everything he had at him, as did Masters Champion Patrick Reed and long hitting Tony Finau. England’s Tommy Fleetwood shot 63 on Sunday. But none of it fazed the unflappable Koepka who proved that he could putt better than expected and that 2017 was no fluke. Just to add an exclamation point to his second U.S. Open victory, Koepka wrapped up the PGA Championship in August for his third major. No fluke at all! Francesco Molinari looks like a guy who rides the bus to work and spends weekends puttering in the garden or playing soccer with his kids. In other words, he looks like a regular guy – certainly not a world class athlete or the Champion Golfer of the Year. He had toiled in relative obscurity on the European Tour with just four wins in 12 years before the 2018 season. But a win in May at Europe’s BMW Championship, followed by another at the Quicken Loans event in the U.S., propelled him into the spotlight at Carnoustie for the 147th Open Championship. By Sunday’s final round, Molinari was three back of leaders Jordan Spieth, Xander Schauffele and Kevin Kisner. Tiger Woods, Rory McIlroy and Justin Rose were also close. As the leaders went backwards, it was Woods and Molinari who battled for the lead. When Tiger made double bogey-bogey on 11 and 12, the Italian calmly parred them both to grab a three-shot lead that he would never relinquish. Even regular guys can be Champions. As far as tight races are concerned, the 2018 Ryder Cup was over on Day 1. The Americans took the morning matches 3-1 but Europe roared back with a 4-0 drubbing in the afternoon foursomes. Saturday saw the lead widen even further with Francesco Molinari and Tommy Fleetwood extending their individual records to 4-0-0. But nobody can forget Brookline in 1999, when Ben Crenshaw inspired his troops to overcome a huge 10-6 deficit and retake the Cup; or at Medinah in 2012 when Europe overcame a similar deficit to win. On Sunday morning at Le Golf National in Paris, Europe held that same 10-6 lead. Would history repeat? Not this time. The Europeans are practically unbeatable on home soil in the last 25 years and none of them were letting their foot off the gas. Perhaps nobody was more elated than Jon Rahm who beat Tiger Woods. Ian Poulter and Dustin Johnson had an epic battle before Poults prevailed 2-up. 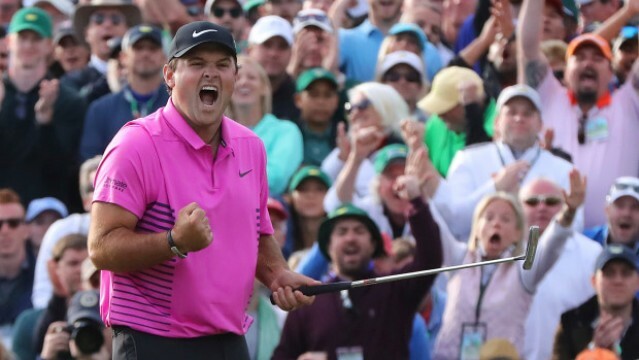 But in the end, it was regular guy Francesco Molinari who took down Phil Mickelson that was the defining moment of this Ryder Cup. The Italian posted a 5-0-0 record to lead Europe to a 17 ½ - 10 ½ victory. By September it was obvious that Tiger was back. He had come close at Valspar and flirted with the lead at both the Open Championship and the PGA Championship. In total he had six top 10 finishes in 2018 but not a win. By the time he arrived in Atlanta for the Tour Championship, he had played as many tournaments as he usually did when he was much younger and had far fewer surgical scars. He looked tired. Even without a victory, he had rekindled Tigermania and his legion of fans was hoping he might finally get one at East Lake. Tiger didn’t disappoint. Although he faltered on Sunday with a couple of bogeys coming home, he settled down and saved par on 17 to keep a 2-up lead. His par on 18 would be called routine, except for the massive crowds that were allowed to follow him on the fairway as he strode towards his 80th PGA Tour victory and first in five years. In a year when a number of long droughts were ended, none were more gratifying to witness than Tiger’s latest win. Every professional golfer from virtually any country in the world will say that apart from the majors, winning their own national championship is the next best thing. For some countries, the competition maybe isn’t too fierce but when your national championship is part of the PGA or LPGA Tour, it means competing against the world’s best players. The last time a Canadian man won the Canadian Open was 1954, when Pat Fletcher captured the trophy at Point Grey Golf Club in Vancouver, and on the women’s side, Jocelyne Bourassa won the inaugural La Canadienne on the LPGA Tour in 1973. That’s a long time ago – 64 years for the men, 45 years for the women. We all know how agonizingly close Mike Weir came to beating Vijay Singh at Glen Abbey in 2004 but the national frustration continued. At least until this year when 20-year old Brooke Henderson grabbed the lead in the final round of the CP Canadian Women’s Open in Regina and didn’t let go until she had that big silver trophy in her hands and the crowd was serenading her with O Canada. O Canada indeed! That’s my Top 10 for 2018. Let me know if you agree or if you have a different list.